Order the PDF digital download for $29.95. Need a softcover copy of this book? We have a limited number of copies available to order. Please contact us for more details. 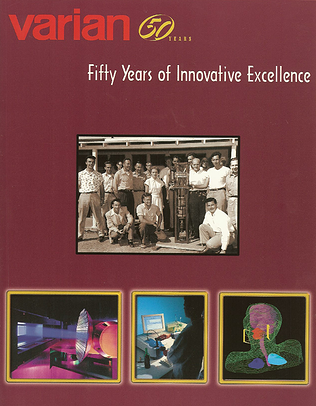 VARIAN: 50 Years of Innovative Excellence: A History of Varian Associates, Inc. from 1948 to 1998 is the authorized 50 year history of Varian Associates written by the Santa Clara Valley Historical Association with the complete cooperation of Varian Associates. The Founders and Their Ideals; Early Days in San Carlos; The Active Role of the Board of Directors; Affinity with Stanford University and the Move to Stanford Land; Multiplying Technologies; The Klystron; Nuclear Magnetic Resonance Applications; The Vaclon Pump; Medical Linear Accelerators; The End of the Beginning; The Acquisition Years; A New Hand at the Helm; Selling Promising But Problematic Operations; Pioneering the Minicomputer; Selling Syva to Syntex; Opportunities Lost — CT Scanners and Ultrasound; New Management Undertakes Restructuring; The Difficult Mid-'80s; A New Approach to Leadership; Attaining Operational Excellence; Exiting Electron Devices; Health Care's Emergence; Instruments and Vacuum; Challenging the Chip Cycles; Accelerating Profitable Growth; Epilogue: The Second Half Century.